Since opening in November 2007, Stadium:MK spent the first 7 years with only the lower tier kitted out with seating. However, it's now been completed and the total capacity is now an impressive 30,500. There are no bad seats in the house and it's a fantastic stadium for a club at this level. 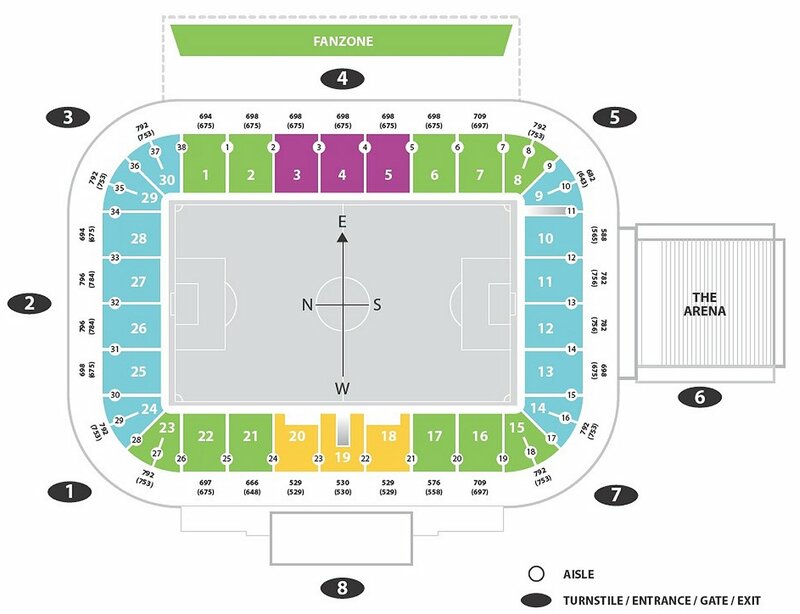 Up to 3,000 visiting supporters can be accommodated and are situated in the north end of the stadium. The view of the action is unrestricted and leg room is very spacious. Facilities are fantastic and the concourse is inside the stadium rather than underneath meaning you can actually continue watching the game whilst buying your hot dogs or pies. A fantastic addition to a very smart stadium. The Beacon is around a five-minute walk away otherwise it's a 20 minute walk into Bletchley where there are a few pubs to be found. The Enigma Tavern on Saxon Street being one of them. In Milton Keynes centre there are a number of bars located adjacent to the main shopping centre, or within walking distance of Milton Keynes Central station. If you come out of the station you go straight up Midsummer Boulevard in front of you, then after around five minutes walk you will find a Wetherspoons outlet called the ‘Secklow Hundred’. If you're looking for something to eat, there's a KFC and a McDonalds situated just next to the stadium. There are approximately 2,000 car parking spaces at the stadium, which are available at a cost of £5 per vehicle. Alternatively you're able to park in the Denbigh West industrial estate. Milton Keynes Central is the main railway station and the most likely one that you'll arrive at. It is however, approximately four miles away from the stadium and therefore a taxi ride from the rank directly outside the train station is a very likely bet. The nearest railway station station to MK Dons' Stadium:MK is Bletchley. From here you're approximately 30 minutes walk away so I'd advise to jump into one of the waiting taxi's at the rank outside. Alternatively, you can walk into the town centre and hop onto one of the buses at the main bus station. Travel: I got the train up from London which was relatively pain free, and impressively cheap on the trainline! Arriving early, i walked to the town which was a fair jaunt through numerable concrete obstacles and office blocks. I grabbed some lunch and jumped on a bus to the stadium, which took a solid 30 minutes to get to in light traffic. All in all, it was a bit of a nightmare to get to as the stadium really is in the middle of nowhere. Refreshments: On the walk from the main station to the town there is a Wetherspoons if you need to grab lunch and a beer. Pub wise, in the town that really is it from what I saw. It's not really a town centre, but more a massive shopping centre. Have a few beers and lunch in spoons and then walk back to the station to catch a bus to the ground as there really isn't much else to tempt football fans to the town centre. Impressions: First off, it's in the middle of nowhere. Probably a good 3 miles from the town centre, and only the stadium hotel and a sports shop next to it in the car park. Outside, it's a really impressive new build: Large and imposing and that's only confirmed further when you enter. It's massive, and really well laid out. Unfortunately, it just lacks soul. Don't get me wrong, the fans obviously love their football but it all just seems so fabricated and hollow. It feels incredibly Americanised, for lack of a better word. Large adverts everywhere and kids flying flags with hotel sponsorships on them as the players entered only made things worse for me. There was a section of MK fans singing, but they were out sung by the small following of Peterborough fans who did impressively well to keep up their spirits for 60 or so minutes, despite their team getting played off the pitch and losing 3 - 0. You only realised there was a large Dons following when a goal was scored, but other than that it was pretty dull. Facilities: Facilities wise, if you come to stadium MK you're basically going to find the best in the championship, and certainly up there with bigger clubs. It's brand new so everything is spot on - massive toilets, plenty of places to eat, helpful staff, comfortable seats and a great view. Being a bit more 'professional' than other places, food is expensive however. Exit: Nightmare. The stadium, was nowhere near full (I'd say it was at about 1/3rd capacity) and i even left 5 minutes early knowing i had to get the dreaded bus back to the station, but it was still a massive ordeal to get anywhere. With 90% of the crowd leaving by either car, coach or bus the roads where absolutely rammed. Waited 25 minutes for a bus, and once i was onto one it took a solid 40 minutes to get back into town. Enjoy: It's not for me. It had a lack of atmosphere and has so far has been the least favourite ground on my travels. The stadium itself is impressive but they need premier ship football to fill the seats and get some atmosphere going. Now they are in the Championship, that may become a little more of a reality but based on my visit, I certainly wouldn't rush back again. Travel: I used the supporters coaches provided by BCFC. The coach park is right outside the away end and they do stay there throughout! The location is rather annoying as it took us longer to get parked up than it did to get from Bristol-MK. (Slight exaggeration but it seemed like it) The stadium is right in the middle of a shopping estate. The only pub was in the MK arena other that that getting some alcohol in the Asda outside the MK arena is your safest bet unless you want to pay L4.00 in Frankie and Bennies. Refreshments: There wasn't any pubs around except from in the Arena the other side of the stadium. I Had a packed lunch on the coach as there were 5,109 city fans going and I dint want a repeat of Coventry so I didn't use the food outlets inside or out. Impressions: I must admit i didn't realize we were at the stadium as it has a hotel sign on the side and it really did look like a hotel rather than a football stadium. The gates were easy enough to find but the seats, not so much. There was nobody to tell you that you had to go through a separate set of turn styles with no stewards to get to the upper tier. It was confusing but once we found our,what seemed like, cinema seats, The stadium does open up on you. It was very impressive in size i must say but no offence far too big for MK Dons. The atmosphere was quite loud before the game from the city fans but as there were a lot who were going to their first away games not many songs were sung through out and as it was a rather dull 0-0 draw it was understandable. Facilities: The toilets were a little small for 5,109 fans even though there were 7 of them open there were still a lot of queues, I didn't use the food stands as the queues were far too long. The leg room was more than adequate as fans could fit by without you even moving. Exit: The exiting process was very quick and easy as the police closed the road for all 8 coaches to leave, we were back on the main road back to Bristol in no time. Enjoy: I did enjoy my day, shame about the 0-0 but i would more than happily return to stadium MK in the future. 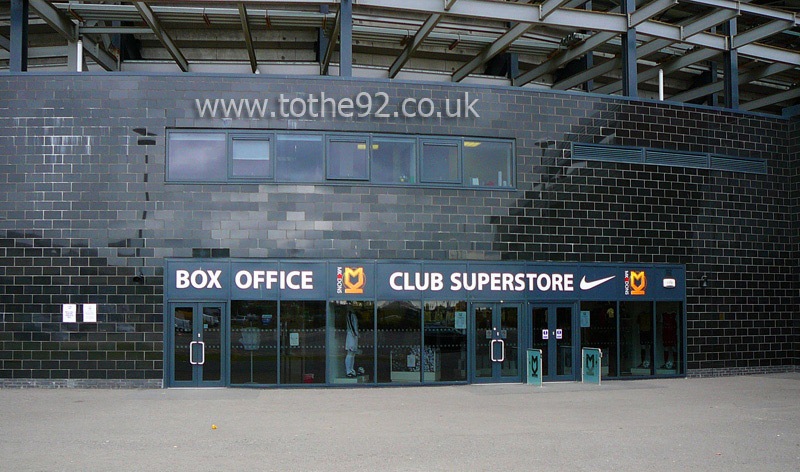 Have you been to Milton Keynes Dons' Stadium:MK? To tell us about your experiences and to feature on the site, simply complete the fans review form below!